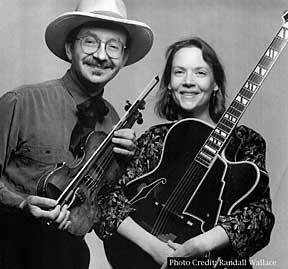 If you love American acoustic music, don't miss Jay Ungar & Molly Mason. These extraordinary musicians won international acclaim after Ken Burns' The Civil War hit the airwaves. Their performance of Jay's haunting composition "Ashokan Farewell" — the musical hallmark of the PBS series — left a lasting impression on everyone who tuned in. The soundtrack won a Grammy and "Ashokan FarewA Jay & Molly concert appeals to all ages. There are timeless renditions of hard-driving Appalachian melodies, Cajun and Celtic fiddle tunes, stirring Civil War classics, sassy songs from the golden age of swing and country, stunning waltzes, and moving original works. Wit, warmth and consummate musicianship add up to an exciting evening that cheers the heart and feeds the soul.